In some places we were only a few miles from the Swedish border and not that far from the sea. I drove the 105 miles to a place called Grong. The scenery through these mountain valleys was the most spectacular of the whole trip. Since Marcia was asleep I had to carefully watch the winding road as I held the camera to attempt to get some video of this incredible area. I was grateful that there were very few cars sharing the road with us in either direction. 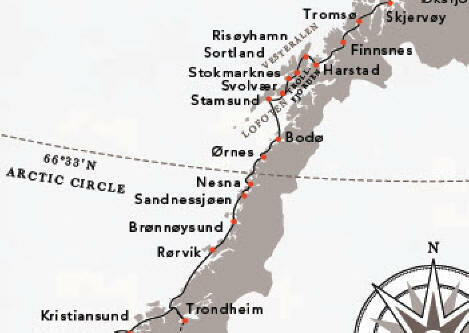 At 2:30, Marcia woke up and took over to drive the remaining 138 miles to the city of Mosjøen, a bustling little shopping town 46 miles south of Mo I Rana. The timber buildings date from the 1800s. Marcia needed to find a place for “lunch” so I decided it would be a good time to run since it was already 5:15. I ran through the downtown area which was rather cute but half way through I had to go to the bathroom so bad, I literally couldn’t hold it anymore. I ran everywhere looking for a restroom and finally found one inside the large shopping complex. This is the first time I have ever had to cut a run short to sit down. Marcia enjoyed her lunch and finished up while at 6:00, I got on the cell phone to chair the 40 minute ThinOptX board of directors meeting in Abingdon, Virginia. 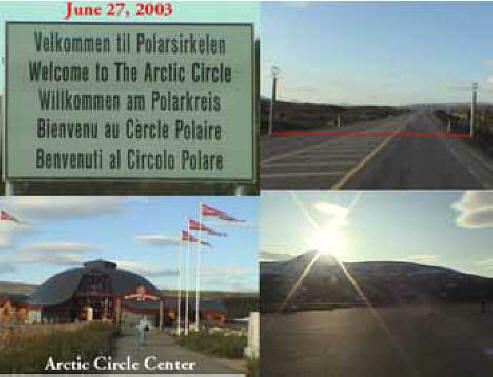 At 6:10, I drove 107 miles north on the E6 to reach the Arctic Circle they call Polarsirkel. The scenery had changed from mountainous canyons and valleys to a flat valley between far-off mountain ranges. 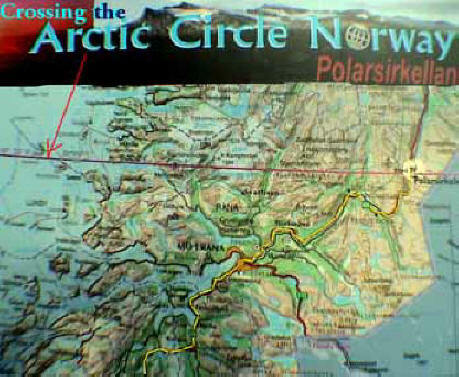 We reached the Arctic Circle crossing line at 8:30 and pulled in to visit the tourist center and shop. 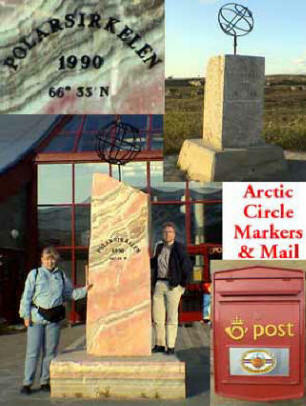 We bought a few trinkets and posed next to the Polar Circle monument placed in 1990 (above left.) We wandered the area and came upon a very large monument with a large stone star with the communist hammer and sickle on it (above right.) 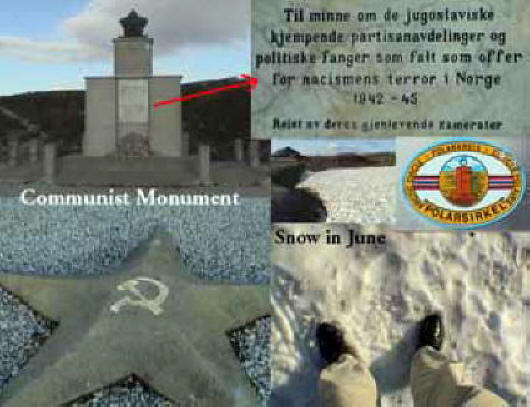 The inscription said something about Yugoslavia and also Nazis. Not sure why it was there or who put it up. Nearby the land was blanketed with a heavy layer of snow which I had to step in. I threw a few snow balls at Marcia which she frowned me into quitting. 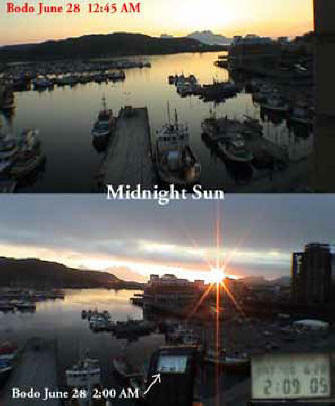 It was still broad daylight at 8:45 as we headed north. 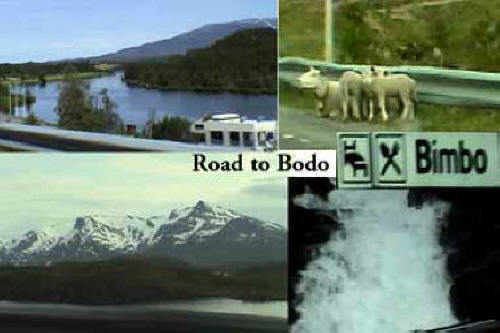 Marcia drove the 60 miles to Fauske and at 10:00, I drove the remaining miles to Bodø, the Capitol of Nordland (pronounced boo-dah like Budapest.) We arrived at 11:00 and found the Rainbow GTR Nordley’s Hotel [Moloveien, +47-7-553-1900] very easily right near the wharf. We checked in quickly and was I glad I had already ran because the EGON restaurant [, +47-] located in/next to the hotel was ready to close now. After a beer and wine, we had pizza, chicken fingers, chicken kebob, spareribs, corn on the cob and a baked potato. None of it was special, but we couldn’t complain. They make you go to the counter to order and pay for each item in advance and then they bring it to you. Since it was a Friday night, we thought we would see if there were any places to go for an after dinner drink. It was daylight out even though it was midnight so we strolled to the “action” part of town and after trying three places we decided it was a little too much action for us. Many young drunks and very loud music was not what we had in mind. All we wanted was a nice little quiet place for adults. On our way back we stuck our heads in a little place called the Piccadilly Bar [, +47-] (above.) It was perfect. We went in and sat at the bar and each had a glass of port and chatted with the friendly people and the bar lady. We then headed back to the hotel and at 2:00 in the morning the sun was shining over the mountains and it was spectacular. It was hard falling asleep with the sun shining brightly. We had to pull the dark-out drapes to get to sleep finally at 3 AM. We woke up and got up at 9:30 which is early for me. 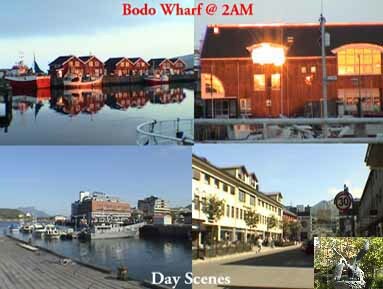 Since we needed to catch the ferry to the Lofoten Islands later, I went out and did my run at 10 AM. 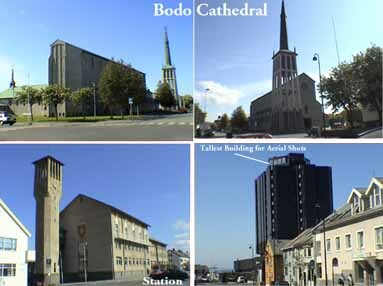 I ran the harbor and most of the downtown city of Bodø, going by their major cathedral (Domkirken) (right) built in 1956; but it was closed. Many of the buildings were quite interesting. I found the tallest building in the city which was the SAS Hotel (right.) My run was over so I thought I could get a cappuccino in the restaurant on the top floor of the hotel. Unfortunately their machine was broken so I settled for taking some panoramic video and photos of the city from the 13th floor. I then walked to the tourist office hoping to find a picture of the mountain in Lofoten but no one seemed to know what I was talking about. Here is the background story. Last spring, we were in Carmel, CA with Dr. Dementiev and Dr. Matteo Piovella (of Italy) after the American Cataract Society Meeting in San Francisco. Matteo bought some beautiful photographic art in a gallery on Ocean Avenue, so I went inside to see what they had. On the wall was this huge color photo of the most unusual mountain I had ever seen. I asked the girl where it was located and the label on the photo said “Lofoten, Norway.” I was determined to see that mountain when I got there. Now I am ready to go there and I learn that Lofoten is not the name of a mountain or a place (ala Grand Canyon) but rather the general name of a string of islands and a peninsula stretching southeast from the northeastern coast of Norway. Now I am in a panic. How do I find this mountain I thought was called Lofoten? I tried to describe it; tried to make drawings of it, but all I got was blank stares. I was able to get a shoddy Styrofoam cup cappuccino out of a machine in the terminal and we shopped the vendors in the area until they told us to get into our cars. I was really tensed up that they could not fit all those cars ahead of us on this small ferry but believe it or not we made it. 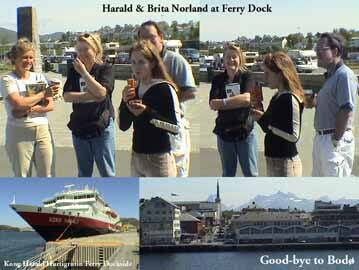 We sailed out of the harbor and while chatting with our new friends we said goodbye to Bodø. As we headed into the Vestfjorden, I was determined to find my mountain.